Perched on its hill, Kensington's small shopping village gazes toward the city with vastness of the western suburbs at its back. It's no surprise then to find a stretch of cafes with a city vibe, side by side along Bellair Street, catching the morning sun. 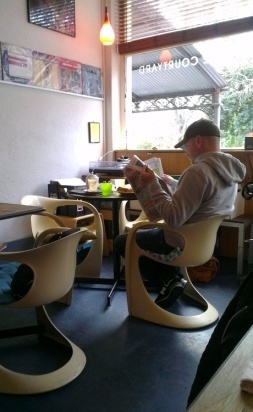 I'm in the habit of scoping out an area before deciding which café most takes my fancy. Striding past a host of appealing yet busy establishments, I eventually came to the one that won me hands down. 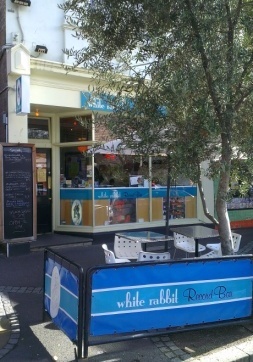 The White Rabbit Record Bar is a music shop doubling as a café and bar. 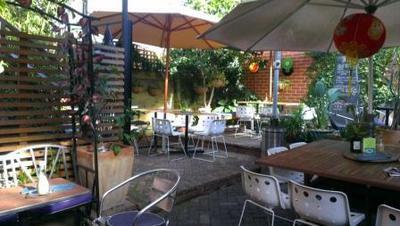 A quaint watering-hole with well-priced café food, as it describes itself on its website.. 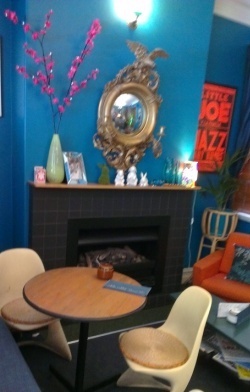 If retro vinyl and retro furniture are right up your alley, as they are mine, the White Rabbit will tick your boxes. 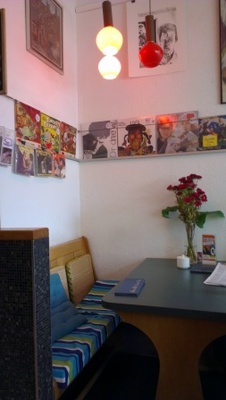 The small front room is dominated by a low-tech DJ set-up, the walls adorned with vinyl covers in various shades of groovy cheesiness. Paintings, colourful hanging lamps, bright retro fabrics and vases of flowers add to the retro-chic aesthetic. As a certain lady once sang, these are a few of my favourite things. An old turntable in the corner enjoys its retirement. 'Curiouser and curiouser' said Alice. Up a couple of stairs, the bar and inner room is equally eye-catching, with blue walls and 70s-style décor in a more intimate living-room kind of setting, complete with armchairs and coffee table. And there's one further area for your seating choice: the courtyard out the back. Though it was winter and a bit on the nippy side, the sunny pot-planted nature of this courtyard made me want to settle in for an afternoon with a group of friends (though perhaps in the more seasonally compatible future). The indoor atmosphere for brunch was very pleasant. The jovial chappy manning the bar would occasionally attend to a CD in the DJ booth, but the volume was perfectly adequate. 'The Best of The Smiths' was playing as I arrived—I was sold before even sighting the menu. 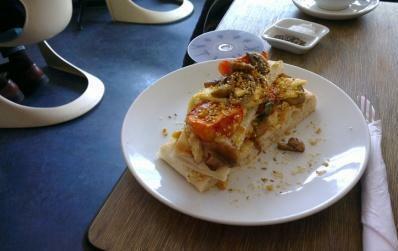 As for the menu, there was a notable presence of dukkha, that delicious blend of Middle eastern spices. Salads and wraps, panini and mixed platters, 'build your own eggs' (my expression). On the drinks list, an admirable array of hot alcoholic beverages – mulled wine, Irish Coffee, the Donny Darko (dark rum with Italian hot chocolate – oooh) and Alice in Wonderland themed cocktails alongside the classics. While I was eating, I was able to peruse a box of 7 inch singles for sale ($2 for Racey's 'Some Girls'. Now I'm showing my age.) The front room is peppered with boxes of records for sale and friendly signs beckoning one to browse. I even picked up a free CD which turned out to be rather good. I have yet to experience the evening vibe; I suspect it could be something of a hipster hangout, not that that's a bad thing. Why not make like Alice and head down this rabbit hole to find out for yourself? The White Rabbit Bar is so accessible by public transport, being just a couple of train stops out of the CBD on the Craigieburn line, with the station exit just across the road. Wonderland is not much further away from the city than the bars of Fitzroy. Why? Browse music alongside breakfast, brunch, dinner and drinks.